This little gem came to a surprise two days after my birthday just last week and a tweet popped up on my phone saying I won this from a twitter giveaway. I don't normally enter many giveaways but I have been following @DaveLackie for awhile and he shares many luxurious giveaways including Nars, YSL and many more beauty brands and when Dave had this lovely D&G up for grabs, I thought to myself and said why not? All one had to do is make sure you're following the lovely Dave and Retweet the post. To my surprise I was one of the lucky ones and It was a great belated gift to me! When I received it, it was packaged really nicely with a lovely note from Dave saying congrats on the giveaway. 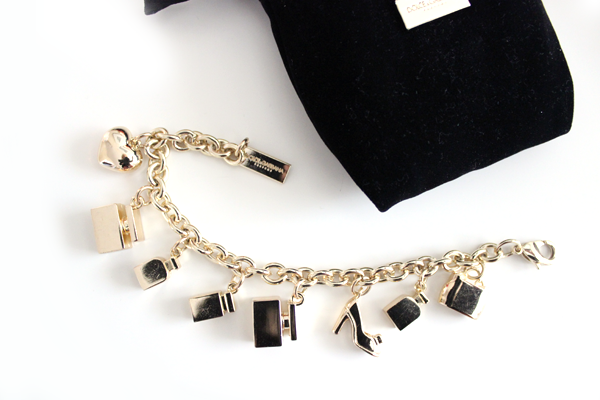 The Bracelet itself has eight charms including a Shoe, Perfume Bottles , a Handbag and a Heart. It is quite a heavy bracelet with all the charms but that doesn't bother me. The bracelet itself is stored in a lovely black velvet pouch with a gold plated D&G logo. I don't normally wear alot of jewelry myself but think this little gem would be perfect for evenings and for certain events. Do you own anything from the D&G Jewelry Range? Share your thoughts and let me know in the comments below. Wow it looks stunning, congrats !!!! !